The Canadian Centre for Financial Literacy (CCFL) was created in 2008 by Social and Enterprise Development Innovations (SEDI), a charitable nonprofit organization. The CCFL brings together the public, private and nonprofit sectors to expand opportunities for low-income Canadians to increase their financial literacy. We are excited to share the latest news on financial literacy and highlight the work of the CCFL and our partners over the past few months. Please forward this newsletter to your contacts! The CCFL has reached over 200 community groups across Canada. Since the launch of the CCFL in November 2008, its trainers have been tirelessly travelling across Canada to bring financial literacy training to community groups serving low-income people. The CCFL, which was co-founded by SEDI and TD, has trained more than 400 staff of community organizations in over 22 communities nationwide, reaching over 200 organizations. For instance, in May, CCFL trainers visited Lac Seul First Nation, in Ontario, to deliver workshops and learn more about the challenges the community faces when it comes to financial literacy. Click here to read Lac Seul First Nation’s financial literacy champion Sam Manitowabi’s insights on the experience with the CCFL. Our warm thanks to our committed supporters and partners in the public, private and nonprofit sectors for making our work possible. SEDI has submitted two significant reports to both the federal Task Force on Financial Literacy and the Ontario Working Group on Financial Literacy. In the submission to the Task Force, SEDI identifies the need to acknowledge the significant gaps which exist in financial literacy resources for vulnerable Canadians. Click here to read the full report. In the submission to the Ontario Working Group, SEDI shares insights on why it is important for students to be financially literate and suggests three key objectives for financial literacy education in Ontario. Click here to read the report. The federal government’s Task Force on Financial Literacy has posted the written submissions received during its public consultation period from February to May, 2010. You can read and download the written submissions on the Task Force’s website. Over the course of the consultation process, the Task Force received over 300 written submissions, heard from 175 presenters in 14 communities in every province and territory, and heard from another 125 individuals who posted a combined 280 comments on an online forum. In the fall, the group will publish a summary of all the input received. Bring the CCFL to your community. The CCFL is seeking community organizations serving Aboriginal Peoples, newcomers to Canada, youth, women, and families with children across Canada interested in receiving training from the CCFL to build their capacity to deliver financial literacy workshops to their clients. The CCFL is particularly interested in working with community organizations in Eastern Canada, Saskatchewan and Manitoba, and with Aboriginal groups countrywide. To bring the CCFL to your community, please fill out the expression of interest available here and a CCFL staff member will follow up with you shortly. Fifteen staff members from local groups participated in the CCFL training session in Lac Seul First Nation. "In May, two CCFL trainers, Shari Grayson and Melissa Nigrini, visited my community Lac Seul First Nation, in northern Ontario, where they spent three days conducting financial literacy training and learning more about our realities and culture. Lac Seul First Nation covers an area just over 26,000 hectares and is composed of four satellite communities, home to 795 residents. Fifteen staff members from local groups, including Friendship Centres and employment and literacy program facilitators, showed up for the CCFL training sessions. The training was a wonderful opportunity to learn and to invite other organizations to Lac Seul and establish new relationships. The feedback from the participants was unanimous: the training was very helpful and many of us wished we had had access to the information on personal finance earlier in our lives so that we could have benefited from it ourselves. One of the most immediate benefits from the CCFL training was access to information about the Canada Education Savings Grant, which helps low-income families save for their children’s education. The biggest barrier for my community is having people willing to join a financial literacy program when they have so little. There is a personal feeling that when you are without something, it is hard to talk about it. Despite this barrier, we are all excited about bringing financial literacy training to our community." Keynote speaker John Hope Bryant at the 2008 conference. Mark your calendar for the Financial Consumer Agency of Canada’s 3rd National Financial Literacy Conference, set to take place in May 2011. The conference promises to be another exciting networking and information-packed event. Visit FCAC’s website for updates. 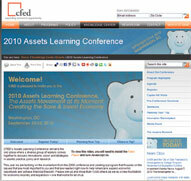 The Assets Learning Conference is the largest national asset-building gathering in the U.S. and will take place this year on September 22-24 in Washington, D.C. The conference, entitled The Assets Movement at Its Moment: Creating the Save & Invest Economy, will bring together more than 1,000 domestic and international movers and shakers to discuss innovations in practice, policy and research to help people save and build assets. The event is organized by the Corporation for Enterprise Development (CFED), a national nonprofit based in Washington, D.C. Check out CFED’s website for more information and to register. 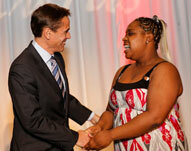 CBC’s Mark Kelley congratulates 2008 SEDI Award winner Belinda Swaby. SEDI Awards: Tickets are now on sale! Join CBC’s Suhana Meharchand, CTV’s Pat Foran, Dragons’ Den’s Arlene Dickinson, keynote speaker W. Edmund Clark (President and CEO of TD) and many more in a celebration of triumph over poverty. The fundraiser and gala dinner recognizes people who overcame poverty with the help of programs developed by SEDI and/or its community partners in the areas of financial literacy, saving and asset building, and entrepreneurship. The event also honours passionate staff members of community groups from across Canada who go the extra mile to help people make their way out of poverty. The 5th SEDI Awards will be held on November 3, 2010 at the Arcadian Court in Toronto from 5 p.m. to 9 p.m. Click here to buy your ticket today! To purchase over the phone, please call us at 416-665-2828, ext. 223. Those who buy tickets by September 17, 2010 will receive an exclusive SEDI/CCFL memory key. This year’s winners and runners-up for the SEDI Awards have been announced. Click here to read their remarkable stories. SEED fights poverty by helping people save for the future. Supporting Employment and Economic Development (SEED), a non-profit agency that fights poverty and helps renew Winnipeg's inner city, is scaling up its groundbreaking asset building programs by replicating them across Manitoba. For almost a decade, SEED has been offering programs such as Individual Development Accounts (IDAs) and Saving Circle to help people save money for future goals. Today, the organization’s matched savings programs run at 13 community-based organizations serving low-income people in Manitoba. In order to replicate these programs in the province, SEED worked in collaboration with the United Way of Winnipeg and Assiniboine Credit Union to form the AssetBuilders partnership in 2006. Member organizations receive training and technical support from SEED to deliver matched savings programs. The success of the AssetBuilders partnership model relies on the enhanced efficiency gained through economies of scale while retaining the flexibility to adapt programs to the unique needs of different target groups. For more information, visit SEED’s website. The TD Financial Literacy Grant Fund, co-founded by SEDI, thanks those who submitted an application for grants. Stay tuned for the next call for submissions! For more information, please visit www.sedi.org/grantfund. If your organization is a CCFL partner and would like to share success stories and events related to the great work you are doing in the area of financial literacy, please contact Luciana Tuzino at ltuzino@sedi.org. 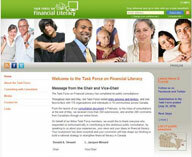 To find out more about the CCFL and the latest news on financial literacy, visit www.theccfl.ca. To sign up for this e-newsletter or to unsubscribe, please send an e-mail to support@theccfl.ca.